Melt 2 tablespoons I Can't Believe It's Not Butter!® Spread in a large oven-proof nonstick skillet** over medium heat. Add garlic, vegetables, and Italian seasoning; cook until tender. Meanwhile beat remaining 2 tablespoons Spread, eggs and 3 tablespoons water with a wire whisk until foamy, about 1 minute. Stir 1/2 cup cheddar cheese into egg mixture. Reduce heat to low and stir in egg mixture. Lift set edges of frittata with spatula, tilting pan to allow uncooked mixture to flow to bottom. Cook until almost set. 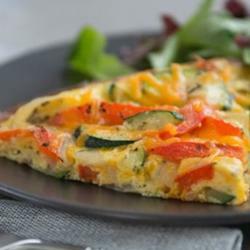 Top with remaining 1/2 cup cheese, then broil 2 minutes or until golden brown and eggs are set. *Create your own by combining equal amounts dried parsley, dried oregano, and dried basil. **If oven-proof skillet is not available, before broiling, thoroughly wrap handle of skillet with heavy-duty aluminum foil. Tip: Also makes a great sandwich. Just slice into wedges and serve on crusty whole grain bread!